This is the 6th part of the gameplay tutorial series focused on turn based grid battles – you can find part 1 here. In this part we’ll add a teleport battle to fight a grid battle in a different scene. For this, we first need to set up the grid in the battle scene, create a new battle start event for changing to the battle scene and set up the battle in the field scene. We’ll also need new battle end events to get back to the scene we came from, but they don’t need a special setup like the battle start event, so we can just use the events created in this gameplay tutorial. 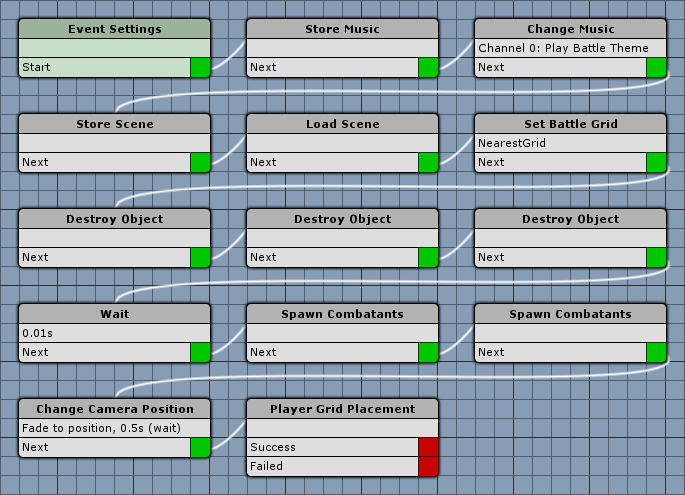 First, we’ll set up the grid in our battle scene – open 4 Battle Arena (can be found in Assets/Tutorial Resources/Scenes). We need a spawn point in the scene, create a new spawn point using the ORK scene wizard (Create Object > Spawn Point) and place it at X=0, Y=0, Z=0. The spawn point’s Spawn ID should be 0. Add a new Battle Grid to the scene by using the ORK scene wizard (Create Object > Battle Grid) and place it at X=0, Y=0, Z=0. Change the following settings in the Battle Grid component. This means that the game object will be the center of the grid. This cell type will be used by all placed grid cells. This cell type will be used by all cells that couldn’t be placed on the ground. We also want to automatically use a blocked cell type when the ground slope exceeds a defined value. Select Default (or whatever layer your ground is placed on). Set to X=0, Y=10, Z=0. This will add 10 to the raycast’s source Y-position, i.e. it’ll raycast from a height of 10 above the game object. This would add an offset to positions hit by the raycast when placing cells. Now, click on Generate Grid to generate the grid cells using those settings, but you wont see it yet. This will automatically show the grid when the scene is loaded. Since we only load the scene when starting a battle, we don’t need to hide it. Now it’s time to paint some blocked cells on the grid – select the Paint mode in the Grid Setup and select the grid cell type you want to paint. Paint blocked cells on the grid where you like, e.g. creating different paths. Next, we’ll need to add deployment cells for the player. Paint 3 cells as player deployment cells, e.g. in one of the corners of the grid. Finally, we’ll paint some enemy deployment cells. Paint 3 blocks of 3 enemy deployment cells – we’ll be fighting against multiple enemy groups. If you want, you can also paint some Heavy Ground cells for higher movement costs on some parts of the grid. I’ve painted all narrow paths with heavy ground. 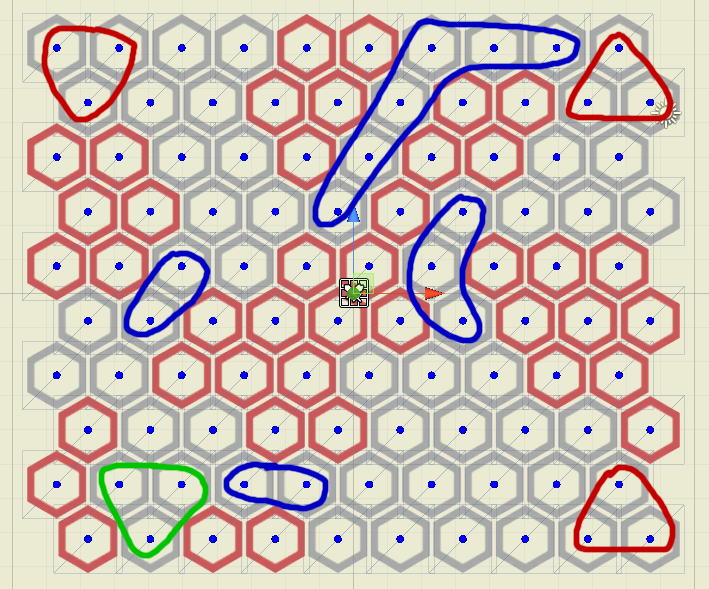 The player deployment cells are marked green, the enemy deployment cells are marked red and the heavy ground cells are marked blue. That’s it for the battle scene – don’t forget to save the changes in the scene. Next, we need to set up the battle start event for the teleport battle. Open the ORK Framework editor, navigate to Events and create a new battle start event. Change the following settings. First we’ll store the currently playing music so that we can return to it after the battle. No further settings needed, since we’re using the default channel and only want to store 1 track. Now we’ll play the battle music. Before changing to the battle scene, we need to remember where we’re coming from. Now we’ll load the battle scene. Set to 4 Battle Arena. Select black with no alpha (R=0, G=0, B=0, A=0). Select black with full alpha (R=0, G=0, B=0, A=1). After the new scene has been loaded, we need to set the battle grid used by the battle manually. We need to destroy the game objects of all combatants participating in battle, as they’ll automatically be spawned when teleporting to the battle scene. First, we’ll destroy the player group objects. Next, we’ll destroy the enemy group objects. Now we’ll destroy the ally group objects. After destroying the game objects, we need to wait for a short moment before spawning the combatants on the grid again. This will spawn all not yet spawned enemy combatants at their battle spots – which will automatically be placed at a free deployment cell. This will spawn all not yet spawned ally combatants (i.e. not player combatants) at their battle spots – which will automatically be placed at a free deployment cell. Now it’s time to use our new camera position. This will start the player’s combatant placement dialogue – no further settings needed. And that’s it for the battle start event – click on Save Event to save it, e.g. as gridTeleportBattleStart. The battle end events for teleport grid battles don’t require any special setup – you can use the battle end events described in this gameplay tutorial. Finally, we’ll set up a new battle for our teleport grid battle in the field scene. Open 2 Field (found in Assets/Tutorial Resources/Scenes), use the ORK scene wizard to add a turn based battle to the scene (Create Object > Battle > Turn Based Battle) and place it where you want it. Change the following settings of the Battle component. This should be set to 1, since there already is our 1st grid battle in the scene. We’ll manually assign the grid in the battle start event after loading the battle scene. We’ll be fighting all enemy groups we’re going to define. Change the already added first combatant/group’s settings. Click on Add Group/Combatant to add another group. Again, click on Add Group/Combatant to add another group. We’ll override the default battle start/end events here. And that’s it for now – don’t forget to save the scene. Open the main menu scene (0 Main Menu), press play and run into the new teleport grid battle. That’s one tough battle – better get Blue Pants to join you before trying it. The next grid battles tutorial will contain some grid gameplay tips.